In the midst of battle, both sides of this war are pulling out all the stops. All Out War is in full swing and the action that this issue offers is as good as we have seen throughout the entire series. 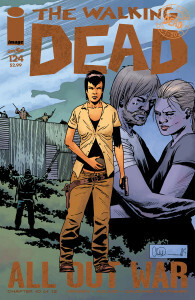 This issue brings us two major plot lines, the first of which follows the journey of a group of defectors from the Negan camp. Starting with the revelation that Dwight is not at all happy with his life within Negan’s camp (Hell, Negan burnt half of his damned face off), we began to realize that although those who were under Negan lead a seemingly protected and empowered life, people were not only pissed off at Negan’s dictatorial way of running things, people were actually scared of the man. And this is all justifiably so as we all know Negan is as big of a jerk as you can ask. We see through their eyes as they find a way outside of Negan’s grasp in an attempt to join Rick and his crew. Meanwhile, the Hilltop is home to one of the fiercest battles in recent Walking Dead history. 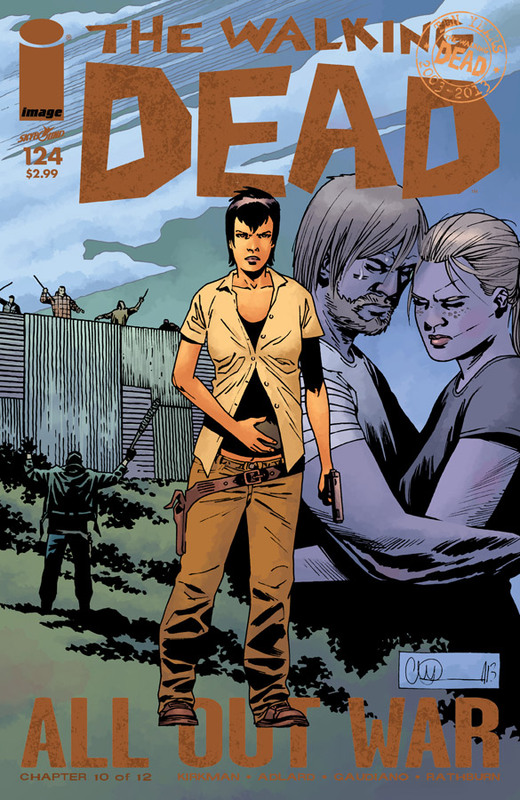 Robert Kirkman, Charlie Adlard, and Stefano Gaudiano continue to find very interesting ways to portray battles within the war. As we have seen before, Negan’s forces have tainted their melee weapons with the blood of the walking dead in attempt to instill a fear in Rick’s army, and this seems to be working it’s magic. And if you were wondering what Rick’s fate would become after his arrow shot to the gut, your questions will be answered. Don’t worry about that! This issue is a whirlwind of intense battle done right. Just when you think one side is done for, you are pleasantly surprised to find the other has something up their sleeve to make you realize that both sides of this battle are more equipped to take each other on than you think. All Out War has not been a disappointment. In fact, it has been a fun and thrilling ride that justifies its bi-monthly release.